A vacation rental can be a fantastic source of income. A vast majority of your guests are going to be respectful, cooperative, and simply looking to have a relaxing trip in their new “home away from home.” But what if you get one of those guests (you know the type I’m talking about) and something goes wrong? While (hopefully!) not common, there are a number of bad experiences that can be a huge bummer when you are a vacation rental host. No matter what your specific negative experience, no need to fear! Here’s our list of tips to bounce back quickly and thrive in spite of it. First things first: be cool and, don’t panic. No matter how bad it may seem at first, you will bounce back and get this experience sorted out. Chances are good that you are not the first person to experience this issue (more on that below). Before you are able to take the necessary steps to resolve the situation, realize that it is totally ok to feel angry, upset, disappointed, or even violated if that is how you feel. When you pour yourself into your vacation rental – your time, your energy, your money, and your tender loving care – it can feel really crummy when it doesn’t work out the way you planned. It’s helpful to remember that bad experiences with vacation rentals are truly the minority. While a bad experience can shake your confidence and make you feel vulnerable, these experiences are few and far between. We’d be willing to bet that you are not the first person to have this specific experience (unless you’re that host we mentioned with 100 floaties in a room). Leverage the many vacation rental host forums to learn from other hosts’ experiences and find out what worked for them. No need to reinvent the wheel when others have already been down this road… Find out the protocol to follow and do it! Be sure to remember that even similar experiences may vary: for example, different states have different laws and policies, so results may vary. Even if their experience was different than yours, it will be a comfort to know that you are not alone. Almost all platforms have reimbursement policies, resolution centers, and in extreme cases, litigation support that can help recover any losses or alleviate any trouble. The Airbnb mediation center specifically will help you resolve any dispute with your guest, so be sure to utilize them. If you don’t find information online, don’t be afraid to reach out directly to your platform’s customer support department and find out what they can do to help. Pro tip: Remember that you have 24 hours to report damages! So get pictures and a report filed with Airbnb ASAP. Whether you experienced damage to your home, a bad review, or something else, it’s crucial to be as transparent as you can with everyone involved in your poor vacation rental experience. First, if you have had a nasty review, don’t take it personally or offer an equally negative response, even if the person makes false accusations against you or makes personal comments himself. Instead, reply with empathy, saying that you are sorry he did not enjoy his experience. You are running a business, and your guest is your customer. The customer is always right (even when the customer is not always right!). Second, calmly correct any misinformation for the sake of those who may be reading the review in the future, but don’t accuse or blame. For example, if the person claims that an advertised amenity was not there and you know that it was, you can apologize for the inconvenience but note that the amenity was there during this person’s stay, and will be there for future guests as well. Third, why not fight fire with fire? If the problem was created by a negative review, perhaps it can be solved (or at least alleviated) by positive reviews. If you have other positive reviews that discuss the same topic, you can point readers to those to find other verified third-party confirmation that the negative reviewer is indeed mistaken. For example, in the scenario above, when your negative reviewer claims that a certain amenity was not present at the property during his or her stay, you can point to other reviews that have verified it was present during their respective visits to the property. Don’t worry too much about trying to have a negative review removed from your page, even if it is entirely untrue. In general, if you have mostly positive reviews, readers will be able to discern this isolated incident. Acknowledging a bad review with calm and clarity will speak volumes about you as a host and, believe it or not, make others want to stay in your booking. When it comes to conflict resolution, it’s easy to fall into the trap of believing that there must be a winner and a loser between you and the guest, or even among you, the guest, and the vacation rental platform. This is a common misconception about conflict, and leads to “tunnel vision,” where only solutions in which there is a loser and a winner are apparent. Instead, try looking for a “win-win-win” scenario, in which you, your guest, and the vacation rental platform all benefit. For example, let’s say your guest has a bad experience at your vacation rental because of the vacation rental platform itself, not because of something that you did. Because of the negative experience, she leaves you a bad review. How might this be resolved in a “win-win-win” scenario instead of a “lose-win” or “lose-lose” scenario? One way might be to contact the vacation rental platform and calmly explain the situation. You could suggest to the platform that they offer a partial credit toward the guest’s next vacation rental if the guest removes the negative review, since the fault was the platform’s, not the host’s. How is this a “win-win-win”? While this is certainly a specific situation, the “win-win-win” scenario can be found in almost any situation as long as you are searching for it. 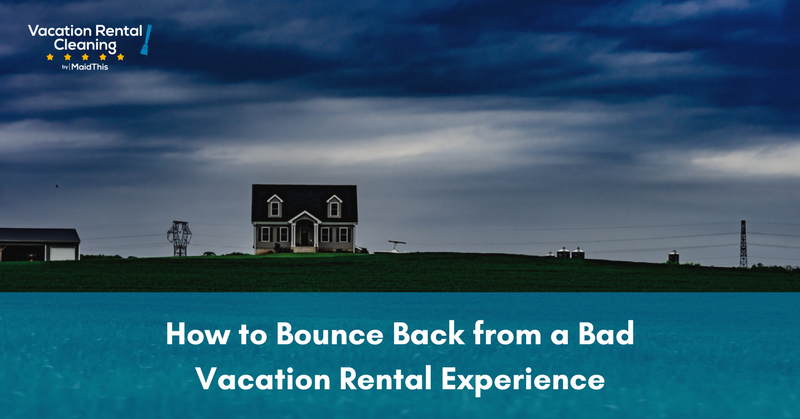 No one enjoys dealing with a negative vacation rental hosting experience, but the good news is that there are resources, people, and mindsets that can help this situation be resolved as effectively and as quickly as possible. Use the tips above to turn even the bad experiences into learning experiences that will ensure your future guests have a memorable experience at your property.